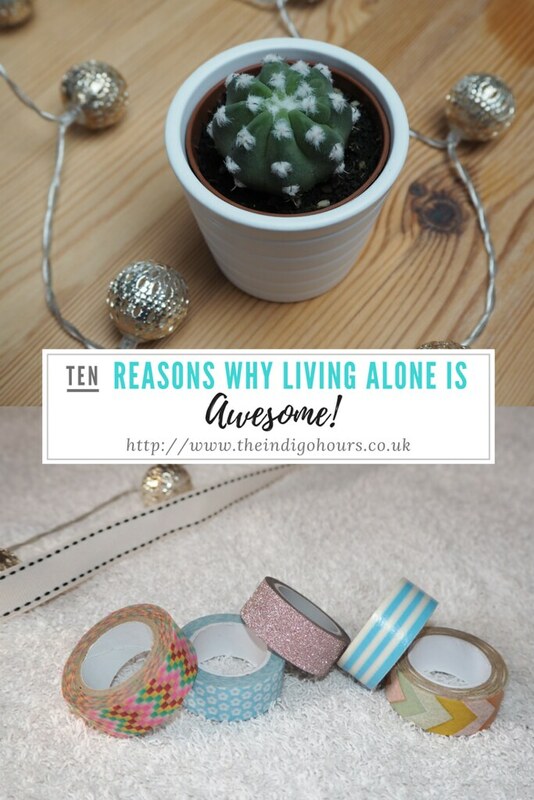 The Indigo Hours | Beauty & Lifestyle: 10 Reasons Why Living Alone is Awesome! Having recently moved out of my parents' house and into a flat of my own, I've been enjoying the freedom this affords me; I've never lived on my own before but, as a definite introvert, it's turning out to be pretty much perfect for me! I don't have to see people unless I want to, and I know I've got my own quiet space to come home to at the end of the day. Bliss. Here are ten reasons why I'm pretty sure living alone is The One. No queuing for the bathroom. Your morning routine revolves around you, and you alone. You can be as leisurely as you like; you can allow yourself exactly the right amount of time in the morning and no-one will spend too long in the shower and make you late. Bonus: no-one uses your favourite toiletries without asking, leaves the toilet seat up, or "forgets" to replace the toilet roll when they've finished it. You only have to clear up your own mess. There's nothing worse than having to do someone else's washing up before you can make your own food. It's so much easier to keep a place clean and tidy when there's only one person messing it up! You never come home and find that someone has eaten the cake/chocolate bar/avocado you were looking forward to. There are certain times of the month when this would literally make me cry - I'm saving it for a reason! Now I don't even have to hide my emergency chocolate stash, it's perfectly safe just in the cupboard. ...The only person who can judge you for getting takeaway three nights running, is the delivery guy. And even this is easily overcome by ordering from a different takeaway each night. No-one can stop you filling every available surface with cacti and candles and other pretty things. Tiny, adorable cacti, in tiny, adorable pots, and gorgeous scented candles in pretty holders and jars. What's not to love?! You get up as early as you like... or sleep as late as you like. There's no-one to disturb if you feel like getting up early and cracking on with your day! Equally, there's no-one likely to start hoovering or doing noisy DIY if you decide you fancy a Sunday morning lie-in. Single-occupant discounts. How boring and grown-up! You can make a saving on your council tax if you live alone, and I've recently discovered that United Utilities offer a similar discount. Hooray for saving a few quid, which can be spent on far more interesting things than council tax and water rates. Like cacti and candles, for example. Things tend to stay where you leave them. There's no knowing you left your keys on the kitchen side, but they're nowhere to be found when you need them. There's no-one "tidying up" when actually all they're doing is making you unable to find things. Do you live by yourself? What are the best and worst things about having nothing but your own company?